Getting tired of portable speakers trying to fit your gadgets inside them? What about one that attaches to it, instead? The Zooka Wireless Speaker ($90) is designed to do exactly that. Connecting over Bluetooth — or via 3.5mm jack, if necessary — this slim-line sound tube sports a rechargeable battery, speakers on either end, and a silicone exterior that provides great grip while managing to not scratch whatever you've put it on, whether it be an iPad, phone, or even laptop. If you're as worried about the looks of your audio system as how it sounds, you should probably have your head examined, and you might just be in the market for some pieces from the Mark Levinson 40th Anniversary Collection ($6,000-$25,000). Created to celebrate the legendary audio brand's 40th anniversary — surprise! — the lineup includes the No. 52 Reference Dual-Monaural Preamplifier, the No. 585 Integrated Amplifier, the No. 519 SACD Disc Player and the No. 560 Digital Audio Processor, all of which arrive with gorgeous, minimalist designs that would look as normal in a museum as they will in your home theater cabinet. Bang & Olufsen, purveyor of pricey AV products, has announced a new brand and the offshoot's first product — the B&O Play Beolit 12 Portable Music System ($800). Designed by Danish designer Cecilie Manz, the Beolit 12 features sleek looks topped off with an Italian full-grain leather carrying strap, and packs in Apple's AirPlay technology, a built-in power supply, and a rechargeable battery that's good for 8 hours of use. Its 120 watt amplifier system individually drives two 2-inch tweeters and a 4-inch woofer. High-end speaker house Klipsch is getting into the AirPlay speaker game in a big way with these Klipsch Stadium Speakers ($TBA). Apart from the aforementioned, Apple-friendly Wi-Fi audio streaming capability, this tabletop system features two one-inch, horn-loaded tweeters, dual three-inch midrange drivers, and two 5.25-inch subwoofers to deliver fantastic sound. They've got brushed aluminum cabinets, and no-nonsense style that's surprisingly suitable for a variety of decors. We've been fans of Eton's sun-powered speakers in the past, but unfortunately direct sunlight equals quick overheating messages from most devices. The Eton Rukus Solar ($150) takes care of this problem by acquiring its audio over Bluetooth, letting you store your device safely in the shade — or in your pocket. 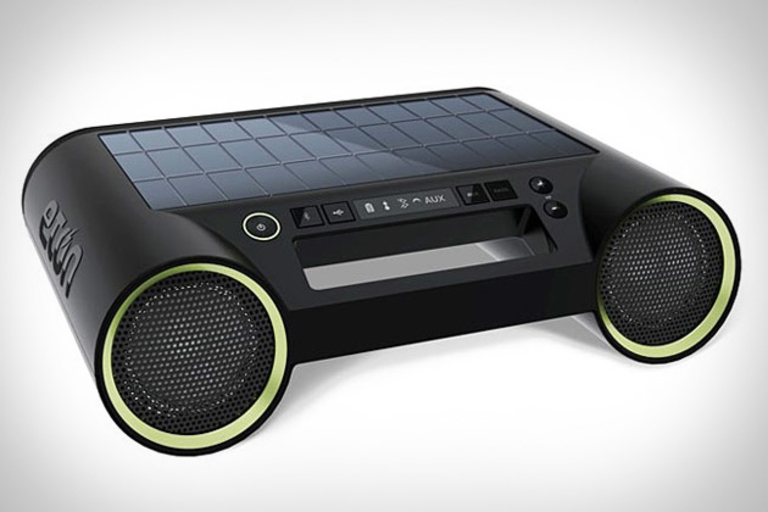 Other features include an easy-to-grip handle, an E Ink display, the ability to run off AC or solar power, dual 2.25-inch speakers, and an aux-in jack. Sunlight not included. Turn your dad's old school speakers into AirPlay-enabled wonders with Griffin's Twenty Audio Amplifier ($TBA). Just add an Apple Airport Express to this white brick, and it takes your existing non-powered speakers and lets you stream lossless audio from iTunes or any other AirPlay-enabled iOS device. The Twenty offers a 2.1 channel sound system with 20 watts output per channel with support for a powered subwoofer, and sports a big aluminum knob for adjusting the sound. Because who doesn't like playing with knobs? We like it when products combine multiple ideas into one — so integrating a speaker into a giant volume knob is pretty much the best thing we've ever seen. Okay, so maybe it's not that amazing, but the Hidden Speaker ($120) is pretty damn cool. Powered by rechargeable internal batteries offering over 30 hours of play time, it uses Bluetooth for wireless streaming audio support, and also offers a built-in AM/FM radio, and a 3.5mm input for technologically challenged audio sources.